Benog Tibba is a day trek which involves walking between 15-20 kilometers. It's halfway accessible through a motor able trail. There is a famous temple of Jwala Ji (A form of Godess Durga) is located at the top of the hill. We can enjoy beautiful views of the valley from atop. The trail is a delight for photographers, environmentalists and nature enthusiasts. We cross magnificent colonial buildings and hotels through thick forests. There are magnificent views of Snow Clad Himalayan Peaks and of the Doon and Yamuna Valleys. There will be a walk over the ridge and we will cross many ancient buildings and limestone quarries. 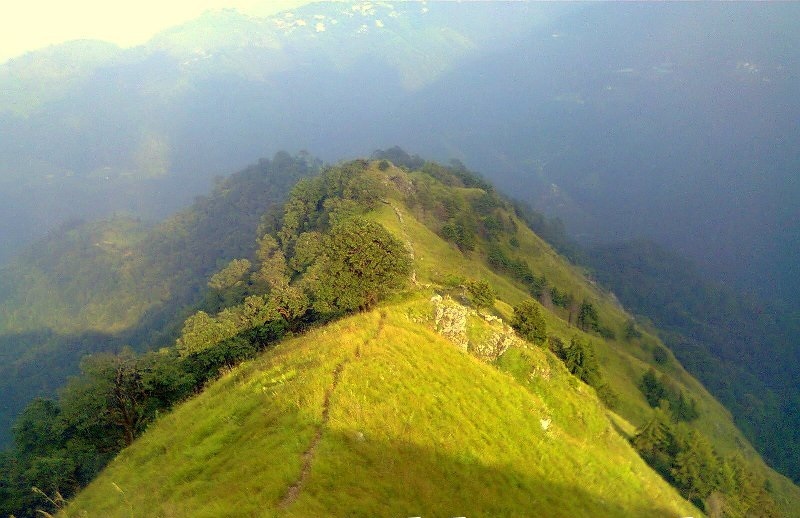 This trek is a delight for both historians and nature lovers. There is Benog Wildlife Sanctuary nearby which houses some rare and endangered species of Himalayan Wildlife. The walk will takes us along Savoy Hotel Building from the Colonial Era which is the biggest in Himalayas. There was a large scale lime stone excavation from this area which started to result in ecological disturbance in this area. Due to Intervention of Supreme Court this area is now under conversation and is been referred as Mountain Quail Sanctuary. The trek starts from Library, a fine Victorian Building at the western end of Mussorie's famous Mall Road. You may catch a glimpse of Ghoral, the wild and almost extinct mountain goat in the thickly forested northern face. Arrive in the Queen of the hills, Mussorie and have a check in your hotel. After rest enjoy your walk across Mall Road where you can enjoy shopping, eating out in the crowded market filled with modern shops and restaurants. Nearby places of interest includes Gun Hill, St. Mary's Church, Kempty Falls, Lal Tibba and Roller Skating Ring which is largest in India. The day long hike starts from Library on the west end of the Mall Road on a trail filled with natural beauty and botanical insights, we will cross numerous landmarks of historical significance including Savoy Hotel, exotic french chateau preserved by the Maharaja of Kapurthala, crossing various famous schools of mussorie amid hills and unspoiled dense jungles preserved by a court order for preservation. You will also come across Himlayan Tibetan Monastery and a walk among dense forest till Park Chungi where there is a small shop for supplies. From there is a short route up to the quarry road towards Everest Estate owned by the son of Sir George Everest a British Surveyor with whom the Everest Peak has been named. The trail than leads to Cloud's End which is a 3 kilometer climb and then finally over a ridge. From here we turn north and walk across lime stone cliffs and then towards a well aligned path for another 3 kilometers to reach the top of Benog and enjoy great views of Snow Peaks and Yamuna River. From here we descend towards eastern face from a pagdandi to the old now closed limestone quarry towards Dhobhi Ghat which is famous for its gushing water springs. From here a one hour climb will takes us to Happy Valley through forest. You will also get to visit the Murray Pumping Station, still functional with its colonial era machinery. From here we ascent to Tibetan Central School, which is build in authentic Tibetan Style and lies in vicinity of a Tibetan Settlement. This place was home to the Dalai Lama when he first fled from Tibet. From here our cars will transport you back to Mussorie.